**NON-RESIDENTS of Glenwood Park are not being accepted at this time as we have hit our quota, and we are no longer accepting applications for the wait list. Please contact pool@glenwoodpark.com if you have any questions. 1. What are the pool dimensions? The pool is Junior Olympic size, and the dimensions are 45 x 75 x 5. 2. How many people does a membership entail? A membership is for a household and all of its members. As of the 2018 season, the dues for a membership that consists of 3 or more people will be $450. All single and two person memberships are $400. 3. What is the guest policy? If we have company are they allowed at the pool? A punchcard with 10 guest passes will be allowed during the 2018 season per membership. Once depleted, a second pass may be purchsed for $50.00. Only 2 guests allowed per visit. Single memberships can always bring 1 guest and do not have to count them as a guest on the sign in sheet. 4. Does the pool have a shallow / wading area for adults and kids or is it just swim lanes? Is there a kiddie pool? What is the children's water feature? The pool does have a wading area for adults and kids. It is located at the steps/entrance to the pool (the “offset” of the L-shape). It is no more than 3 feet deep at any point and has an underwater bench on 2 sides. This shallower area is approximately 250 square feet. There is not a separate kiddie pool. The children’s water feature is a fountain similar to the one in Centennial Park where water shoots out of the ground. 5. What is the swimming season? Traditional swimming season is Memorial Day to Labor Day. This pool has a heater that allows the pool to open first weekend in May and close last weekend in September. 6. Are condos a part of the building next to the pool? If so, how many? Yes. 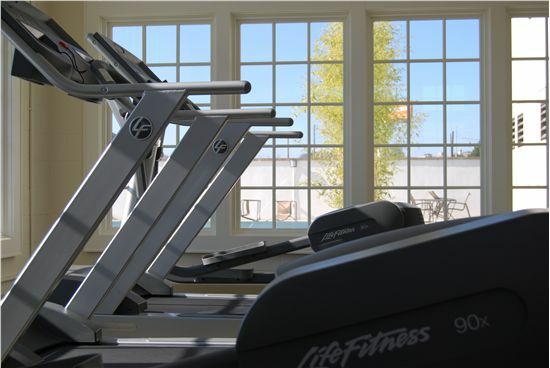 The fitness center/clubhouse area is on the ground floor of a building that contains a total of 9 condo units on its top three floors: 3 units on the second floor, 3 units on the third floor and 3 units on the fourth floor. 7. What is the height of the club house/fitness center? Will it cause the pool to be shaded? 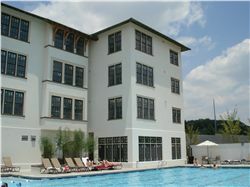 The height of the condo/clubhouse building is 53 feet from poolside/ground level to the top of the roof. It is situated north of the pool and does not cause excessive shade. It blocks noise from I-20. 8. What does the fitness room entail? Does it have weight and cardio machines? The fitness room contains health club quality cardio and strength training equipment from Matrix, including: 3 treadmills, 2 total body elliptical machines, a recumbent bike, an upright bike, a lat pulldown/row machine, a multipress machine (chest press, incline press, shoulder press), a leg extension/curl machine, 10 sets of dumbbells (5-50 lbs), an adjustable utility bench, adjustable abdominal bench, stretching mat and resist-a-ball. The Treadmills and elliptical machines have built in TV panels. 9. Do the restrooms have steam, sauna, etc? No. The restrooms have several showers, sinks, toilets and changing areas. Each restroom also has a diaper changing area. 10. Is the clubhouse a place where a party could be held? Does it have a mini–kitchen facility (service area and refrigeration, sinks)? The clubhouse consists of the fitness area, restrooms, office and vending area with an ice machine. Outside, the pool deck has a special area with tables, chairs, umbrellas, and sofas for picnics. There is no separate room for events, but the picnic area can be reserved for parties or gatherings. 11. Is the picnic area available for events? How do you reserve the picnic area? Will members be unable to use the space regularly because it has already been booked for events? 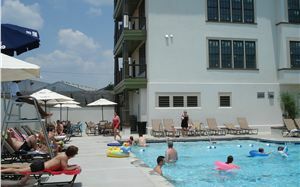 The picnic area is for members only, and a reservation request form can be obtained from the Pool Board. The Pool Board reviews and approves event requests on a case-by-case basis and focuses on not inconveniencing other members by over-booking the picnic area for events. Weekend reservations are discouraged as they are prime time for paying members. 12. Is there be a diving board? No, there is not a diving board. The depth of the pool is only 5 feet so that many more bathers can be in the pool at the same time, and the maintenance costs are much less in terms of chemicals, water, heating, etc. A diving board would also increase liability and insurance costs and would require more lifeguard supervision. 13. What is the WiFi password? 14. What is the swim team schedule? Please see the front desk and the Glenwood Park Pool Facebook page. 15. How do I schedule swim classes? Swim classes are not offered through the pool in 2018. Members must inform the pool board in advance if they wish to hire a swim instructor so the gate attendants will permit entry into the pool. 16. Does the pool have lifeguards? During peak summer weekends, the pool will have lifeguards. When one lifeguard is on duty, a 15 "swim at your own risk" will be called every hour. When two lifeguards are present, they will rotate breaks and avoid calling "swim at your own risk,", so long as the bather load is at a safe enough level to only require one guard. 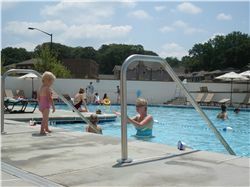 Learn more about the swim classes at the Glenwood Park Pool this summer. Contact Swim with a Purpose. 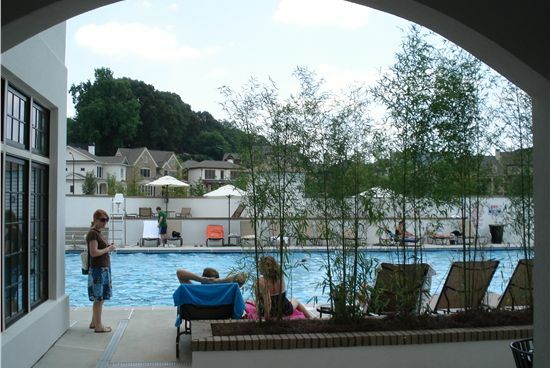 Year-Round Fitness Center, Kid’s Swim Classes with Flexible Scheduling, Wireless Internet throughout the Picnic Area, Unlimited fun in the Jr. Olympic Size Pool and Kid’s Play Fountain. Learn more about membership registration for the 6-lane, Junior Olympic-sized Glenwood Park Pool and Fitness Center. If you are interesting in reserving the picnic area at the pool for a party please send a completed pool event reservation form to pool@glenwoodpark.com for the pool board to review. A reservation requires a $150 Fee and a $200 deposit. All parties have a 3-hour time limit. For additional information and to reserve your party, please contact (pool@glenwoodpark.com). Quick reminders: No glass, no smoking and no pets allowed in the pool, picnic or fitness areas. Thanks for helping us keep the pool safe and healthy for all to enjoy! The pool reopens on May 6.